Help your child develop exceptional reading skills by bringing them to regular Storytimes at a location near you. Each week, we explore different themes with stories, songs, rhymes, flannel boards, special guests and more! 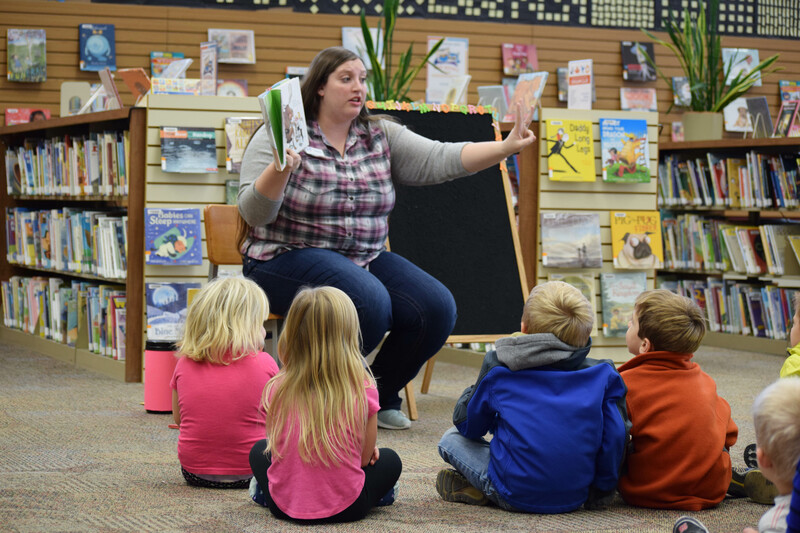 Storytime typically lasts for 45 minutes and is geared for children ages 3-6, although children of all ages are welcome to join the fun. Second Friday at 10:30 a.m.
Thursdays and Saturdays at 10:30 a.m.
Tuesdays at 6:30 p.m. and Wednesdays at 10:30 a.m.
Baby Bounce is intended for children ages 0-3 and features songs, action rhymes, books and flannel boards for the littlest learners. The program helps newborns, toddlers and children just entering preschool get ready for school. Wigglers are welcome! Baby Bounce is a safe space for children to learn and play at their own pace. Second and Fourth Tuesdays at 10 a.m.
Second and Fourth Fridays at 10:30 a.m. If you are interested in bringing a group of children to the library Storytime, please contact your local librarian in advance to ensure we are prepared for your group. Storytime helps children develop a variety of early literacy skills, such as vocabulary expansion, background knowledge and more. We help kids learn that reading is fun and that the library is a special place by instilling a life-long love of learning and reading on early on. Plus, children learn how to participate in a group setting, which is helpful when it’s time for them to be part of a classroom. Storytime is also helpful for parents, as each week you will learn learn new songs, rhymes and stories to share with your children. You will also be exposed to new authors, subjects and creative projects and you may develop a support system with other parents and caregivers who attend.